Last year was my first rodeo at this huge bookish event call Book Expo America (BEA). I was gobsmacked at the size of the building, at all the booths, the events, how organized things was- and yes, the books that were being handed out, the books that were being dropped off in certain locations for people to grab, and the authors that were signing books. It was a book lover’s paradise. Free? Let’s delve into this further, shall we? Back to the free books…. Yes, when you walk into BEA, after getting checked in and having your badge checked- you begin to walk the floor and probably within minutes there will be a smiling face handing you a book saying “it’s the next big X book” OR “this book is something we at X publisher company are excited about”. She’s not standing there with a credit card machine or asking you to give her cash. It is free. Even when you get back to the autographing section, no one is making you pay for the books there. They ask for a donation of $1 per book autographed, though- but they are not monitoring you. 1. 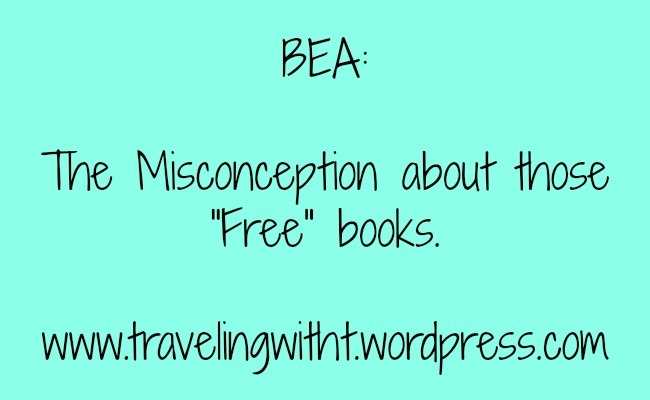 BEA is not a free event. For book bloggers, it starts at $184.00 (and there is a host of other add-on’s you can take part in if you desire). For example, I upgraded my ticket to include the avid reader’s pass which gives you access to a set list of ticketed author signings. Did I have to add that? No. But last year there were a few authors that I was glad I did the upgrade for- and it sells out REALLY quick. 2. Travel. Some people can take trains or live in the city, so travel is not as expensive. However, I’m flying. Between airfare fees and probably luggage fees, I’m looking at over 600 bucks for the trip. 3. Hotel. BEA does partner with hotels to give a discount to people attending BEA and it does help. Getting a roommate helps further. However, it’s another cost to factor in. 4. Getting your books home. Ahh, here’s where you will start crying over those “free” books. BEA and UPS have a partnership where UPS will ship all the folks who wish to take advantage of their services their books home (for a fee, naturally!) Do you have to use them? No, you don’t. You can carry your books around, find a nearby post office and priority mail your books home. You can load your suitcase full of books. However, the convenience of the UPS site is mighty tempting and while on day 1 when your pile of books is on the smaller side- you might not think you need it. But by Day 3- you’ll be begging for it. TRUST. 5. Assorted things- food, drink, etc. Listen, NYC is not cheap. It’s just not. And when at BEA, you’ll find yourself paying for convenience. The little sandwich shop, the big bottles of water, etc- it’s all part of it. Last year, between my share of the hotel, baggage fees, experiencing NYC, BEA ticket, and shipping my books home- it was between $2,500-$3,000. Was it worth it? 100%. I met my blogging buddy, Kristin @ Always With A Book, I met some great authors, made some new publishing contacts, and chit-chatted with some bloggers. I had a great time and I absolutely do not regret going or any of the extra costs. But, and let’s put it in all in perspective- last year as the mean tweets were flying back and forth about people posting the pics of their “book haul” and some people were too afraid to post their pics- a blogger that did not attend wisely stated something to this effect “that she could buy all the books she was interested in reading for less than the trip to BEA.” And she’s right. Or right-ish. If you just go to BEA for the “free” books- then you’ve missed out on a lot of the point. The point is to mix and mingle- get some face time with these publisher folks, to meet some of these bloggers you’ve been talking to on social media for years. The point is not the FREE books. The books are just the frosting on the cake. Remember: There ain’t no such thing as a free lunch. On that note: 37 more days till #BEA15orBust! Excellent post! Anyone who goes just for the “free” books is missing the point IMO. The reason I love attending is to meet up with publishers, authors, blogging buddies, and PR contacts who I’ve never met in person. And yes, to fangirl and gush over my favorite authors! I’m really bummed I can’t make it this year, but hope to go next year. In the meantime, I’ll enjoy hearing about everyone else’s adventures! And yes, I’m looking forward to the book haul posts! Thank you SO much. Yes! What I got really tired of was all the comments about all those “free” books I got. BEA was MORE about the things like meeting publishers, blogging friends, etc.. and FANGIRLING! 🙂 I hope you will get to come next year! And you know I will have a book haul post! Thanks for stopping by to comment! Great post – you make good points. I didn’t know what to think last year when I saw all the condemning posts and comments flying around about people getting free books at BEA. I mean, if someone is going to give me a book I’m interested in for free, I’m going to take it. And if it’s part of the whole event, why feel guilty about it. Your points clear that all up. It’s not the only point and you pay a bit to be there. Thanks. Thanks! It wasn’t till I got back that I started seeing all the posts condemning/comments about the books at BEA. But I was aghast. Now, yes, there were some posts about people being greedy- and I think if you go in with the idea of being greedy and taking multiple copies of the same book- then that is wrong. But getting a copy of all the books you would like to consider checking out for review/promo- that’s a part of BEA. And the publishers WANT you to take the pics and post your pics to social media! BEA is absolutely worth going to and it’s about so much more than the books. It’s an experience you’ll treasure! It is a very exciting event- and SO worth going. But the “free” books are just a tiny part of the fun! Just ask if you have any question- and sign up for the speed dating event at BEA. It’s free- you just have to have already purchased your ticket. And it was probably mine and Kristin’s fav event last year. Oh and we must meet. I’ll be on the lookout for you!! You are going to love it, OnDBookshelf. most excellent post! I’ve only made it to BEA once in 2011 and absolutely loved it. I made the mistake of coming home with 100+ books that I STILL haven’t read all of ~ but it was definitely the camaraderie, dinners, publicists and the extras that made the trip. With that said, it will probably be another year or so of saving before I can make that trek again. Wishing you loads of fun this year my dear! Exactly! Just getting into the venue is fairly expensive, so those books aren’t free in any practical sense. It might be cheaper just to order them all from Amazon, if you have to start factoring in plane tickets and whatnot! It’s one of the reasons I’ve never gotten to BEA. I used to live closer to NYC than I do now, so travel itself wouldn’t have been too expensive, but even the roughly $200-$300 I would’ve ended up spending just wasn’t in my budget. THANK you. It just burns me up when people get all jealous and say things about the “free” books. I understand I don’t have to go- but I want to go so I save money and make plans and it’s expensive. It’s not cheap when you have to factor in flying and then when I get up there I want to DO things- so I always make sure I have budgeted for NYC experiences. By the time I have factored in everything- it would be cheaper to buy all the books I want from Amazon- but then I miss out on the fun of the real experience at BEA. I hope one day you have the chance to go because it’s really something! I never thought about the cost, especially to the event itself. I’m glad you enjoyed it last year and hope this year is just as great. Oh yes! The cost of the ticket is the least of the cost. I know many people can take a train in- and I wish I could so I didn’t have to pay ridiculous amount in airfare! I’m very excited to see what this year will be like! Wow – had no idea there was a controversy over this! Seems a bit overblown if you ask me 🙂 Anyway – if I’m able to get up there on Friday, I’d love to try to catch up with you! Great post. I don’t understand the negative comments on social media about those “free books”. I’ll probably never get to BEA but every year I look forward to reading the posts from bloggers who go. I love to hear about the experience and the books. Have a great time this year!! Right? It just boggles my mind. I know the year that Sue Grafton was there (the year before I went) seeing pictures of people getting a signed book from her made me feel a twinge of jealousy- but not to the point that I would be so negative on Twitter about it! Gah! You might want to check out RT Book Convention next year. It’ll be in Vegas which will be closer to you and I think is similar to BEA. And thanks!!!!! There is no such thing as ‘free’ books anyway, because if you get a book you invest your time and energy in it. You read it and you review it. And like you say, BEA isn’t about going and getting as many books as you can.. It’s about making connections and meeting your friends 🙂 I still don’t understand how people can be SO envious and ill when they spread nasty tweets about BEA. Sure, I’m not going to lie and I’m sometimes a little jealous, just because everyone seems to have such a good time and I wish I could go too 🙂 but I’m happy for everyone and I love looking at their hauls! Excellent point! Your time and energy is also important to consider in this whole “free” book discussion! BEA is a great event- and I hope that everyone who loves books has the chance to go to BEA (or a similar event) at least once! And yes, it’s ok to be a bit jealous when you see a great book haul (I mean we all love books, right?) But what is SO not cool is the bad behavior on Twitter about book hauls. I’m glad you love looking at the hauls- you have the right attitude! I really did not see much bad behavior last year- of course it was my first time and I had no experience to compare it to. I was very polite to everyone and thanked people for the books (of course my momma raised me right 😉 When we found out we had missed a book drop, we were not ugly about it- just moved on, even though I really wanted the book. However, last year many of the people I talked to were not bloggers. They were librarians or owned book stores- etc I only saw about 2 handful of folks that said they were bloggers. (I’m sure there were more- I just didn’t see them). In some areas, it would be very easy to get multiple books and others it would be harder. I do remember the whole blog with integrity thing (at least I’m pretty sure I do). And yes- getting those books home = PAIN. Pain in your wallet and pain in general. UPS at BEA is convenient but you pay for that. I hope this year there will be less drama abt book hauls and just more fun! I’m so happy that I live here so it won’t be that expensive although I did miss out on the blogger conference I guess I will have to purchase way in advance. I’m just going to purchase the day pass and hope I can get some of my books signed. Great post! Great post! I’ve always felt like the people complaining about the free books are just being mean and bitter. The publishers choose to give away these books for free and as long as bloggers aren’t pushy, take only books they’re genuinely interested in, and don’t otherwise abuse the system, they’re not doing anything wrong no matter how many hundreds of free books they pick up. You bring up to other important points I hadn’t thought of but which I agree with completely – first, that people focusing on the free books are missing the point and second, that the books aren’t really free. Bloggers who go to these events often spend a lot of time and money to be there. Thank you!! YES! So, I’m not going to lie- the year that Sue Grafton was at BEA, I was a bit jealous of people tweeting about meeting her and all those people getting her early book. But I didn’t throw a fit. I didn’t take to Twitter and tell everyone to STOP having fun b/c that would have been 51 shades of wrong. It’s life and you can’t always get to go to EVERYTHING. And YES! The publicists want you to take the book. To tweet about it. To take pictures and everything. And as long as you act like you were raised right- then no one has a prob with you at BEA. Start acting greedy and that is a whole other story. AND 10000000000% YES! If you come to BEA JUST for the free books- you’ve missed the point. And apparently don’t know about free- since free to me is not paying a dime for something. BEA is absolutely worth the time and effort to attend at least 1 time in your life! That is embarrassing when I see folks grabbing books. Some take more than one too. I didn’t see TOO much bad behavior- but I did see a little bit. You are so correct….it is not FREE and it is not about FREE books. It is about meeting other bloggers, which I hopefully will be doing this year when I meet you and Kristen. 🙂 I usually meet bloggers each year. It is EXPENSIVE, but I am lucky that my son lives in Hoboken, and I save hotel costs and book shipping. The dear one keeps all my books at his home and brings them home when he visits. it is difficult to wait for them, but it does save. Thanks again for this great post. The BEA is a book lover’s dream with a hefty price tag for most folks, but ohhhh so fun. ENJOY if you go. This most likely will be my last BEA because I don’t have any children in Chicago where the BEA will be next year. Wonder if my son will be happy. Tee Hee. Going to BEA is an experience that every book lover should, if they desire, to take part in at least 1 time. I can’t wait to meet more bloggers! Could you go to BEA if your not a blogger. But you just read alot and would love to meet authors? I’m not sure. I think that is what BookCon is for- it’s right after BEA (like the day after).